Wrestling Twitter was abuzz yesterday with reports that Dean Ambrose was looking to leave WWE after his current deal expired. (Those reports were eventually confirmed by WWE). My first reaction based on the segments before and after the Rollins/Ambrose match on Raw was that it had to be part of a storyline, and that it would play into a Triple H/Ambrose match at WrestleMania 35. Someone even suggested that they may use elements of the Triple H/CM Punk match that didn't happen at Mania due to Punk leaving the company after the Royal Rumble that year. I am not convinced that this still isn't the case, BUT as the day and banter dragged on another idea was floated. Dean Ambrose may just be tired of being a WWE SuperStar. By that I don't mean he's heading to All Elite Wrestling (AEW) *insert Cody listening GIF here*, but that Dean may just be ready to take a break and/or do something else with his life. Knowing what little I actually know about the life of a wrestler I could absolutely see that. I cannot imagine putting in the miles and beating my body up the way these men and women do. If that's what is going on then I hate to see that, but wish Dean well of course if that's what he wants. With all that out of the way, I would like to take a closer look at Dean Ambrose in WWE and discuss some of the narratives we saw yesterday. Dean was underutilized/deserved better--I think that is an absurd take. If you really think that I'd ask you to do the following. Take someone like a Tyler Breeze and ask yourself if he would kill to have Dean Ambrose's WWE resume. Of course he would, and I'm just talking about his singles career. That's without even getting into him being part of one of the most over and protected acts/units in the history of wrestling...The Shield. Dean should jump to All Elite and it would be a huge coup for them--That totally depends on what he wants to do of course. One issue that would harm his value over there is having to go back to Jon Moxley since "Dean Ambrose" is a WWE name. Now I am NOT saying that he has no value due to that, just that for casuals a jump would make a bigger impact if he could take his more recognizable name with him. Not a show stopper, but it is a factor. WWE should never reform The Shield without Dean Ambrose--While I absolutely see the real Shield as Reigns/Rollins/Ambrose, I am not naive enough to think that WWE would refuse to put the trio back together just because any one of them wasn't around. Whether we like it or not it's a business decision for them. If they feel like a pseud-Shield reunion without Dean Ambrose is the play then that's what they'll do. I don't have to like it to see the logic in it. Now an interesting factor here is that we have no idea how Reigns/Rollins would feel about that, and if they didn't want it whether they'd have enough stroke to stop it. In my mind, Finn Balor has kind of been an associate of The Shield, and he's who I would make a third member if push came to shove. They could also just use Rollins and Reigns as a tag team version of The Shield if they preferred as another friend suggested (he specifically compared it to the Shawn Michaels and Triple H doing so as DX during their reunion run). Assuming Dean leaves, let's just hope by the time they want to do another Shield reunion he's back in the fold. That would be best for everyone I think. I will add that I totally respect people not wanting a Dean-less Shield. I had less than zero interest in seeing a Dean heel turn in the shadow of Roman's announcement (or any of the three of them feuding honestly), but we don't always get what we want folks. My personal thoughts on Dean Ambrose in WWE--To me, his greatest value is always as a member of The Shield and even at that I have long thought he's clearly the worst member. My son disagrees as do many on Wrestling Twitter, but it is my opinion. Now when I share my opinion I do at least like to show my work so here we go. His offense actively irritates me. That rebound lariat, and the move where he bounces off the bottom turnbuckle to deliver a forearm to an opponent in the opposite corner are the two most grating ones for me. In general, I think he's just kind of hammy for lack of a better term. If he dialed it down just a little I think he'd be far more compelling. The mic work is over the top, and the goofy mugging, etc. are too. It just does not work for me on any level. I mentioned I never wanted that Seth Rollins v Dean Ambrose feud we just got, but they gave it to us anyway and Dean absolutely lived down to my lowest expectations in every way during it. 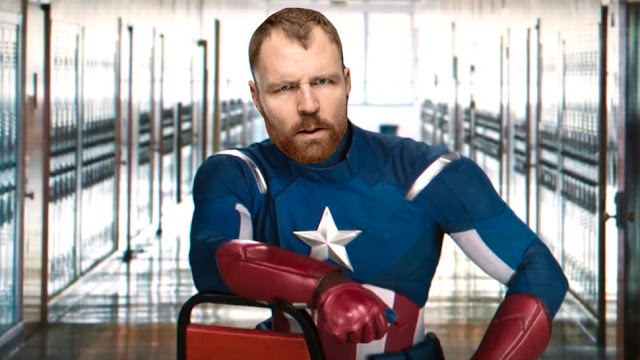 Not saying this is all his fault, but while the whole Dean Ambrose in WWE thing can be amusing it largely does not work for me outside of his time with Rollins and Reigns as The Shield. The most disappointing aspect is that I enjoyed his return from injury as the look was better (haircut was a great idea), and he employed more powerhouse moves. The heel turn killed all that though, and he's been actively bad since. Assuming he's legitimately leaving I hope he eventually returns, and maybe I feel differently about him then. Obviously I hope he returns at some point so the OG Shield can ride again. So...there you have it. My thoughts on this Dean Ambrose news and Dean himself. It will be interesting to see if he's legitimately leaving whether he's even on TV going forward. We will likely have to wait until May (or whenever his deal expires) to get to the bottom of this. It's going to be fascinating. PS if you don't know why I created the image I did here it's a nod to the after credit scene from Spider-Man: Homecoming. When I came up with the title of the article it reminded me of this moment.